From all of us at the Brewer’s Backyard, we hope you have enjoyed this delightful summer in Toronto! As our thoughts turn to autumn so do we towards our final event of the year, Torontoberfest, returning to the Evergreen Brick Works on Monday, October 10th. Torontoberfest will feature a dynamite lineup of Ontario craft brewers to close out our season at this Oktoberfest-themed celebration. We’ll be welcoming Beau’s, Granite, Muddy York, Junction, Side Launch, Left Field, Broadhead and Big Rig to serve up some delicious brews. And on the food front, we’ll thrilled to have back WVRST to serve up some delicious sausages, along with Delight Bite and Sugar Mamma’s. 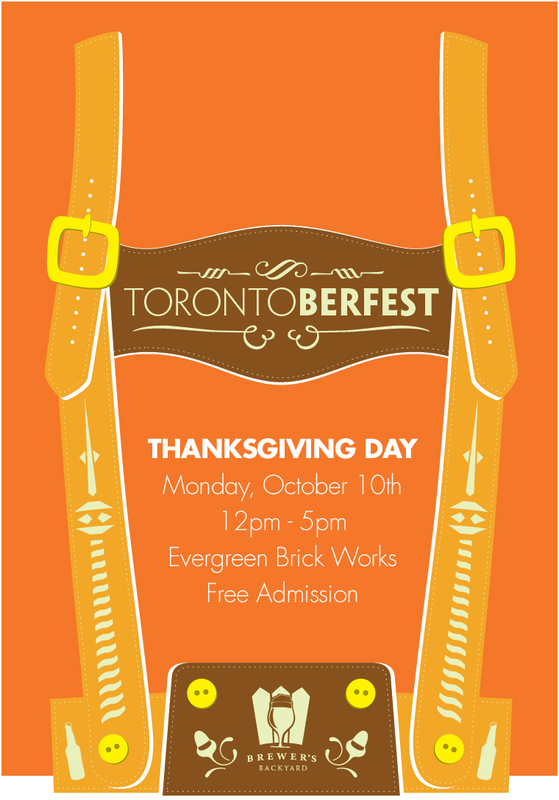 Torontoberfest will run from 12 noon until 5pm on Thanksgiving Day, Monday, October 10th, 2016 at the Koerner Gardens and CRH Gallery areas of the Evergreen Brick Works. As always, our events are free admission, all-ages and no tickets are required. Last beer and food token sales will be at 4:30pm, and last service will be at 4:45pm, so don’t wait too long to come out and enjoy the fun. We will have more announcements as we approach Torontoberfest, so in the meantime mark down October 10th in your calendar and stay tuned to our site and our Twitter handle for more details. We hope to see you then!